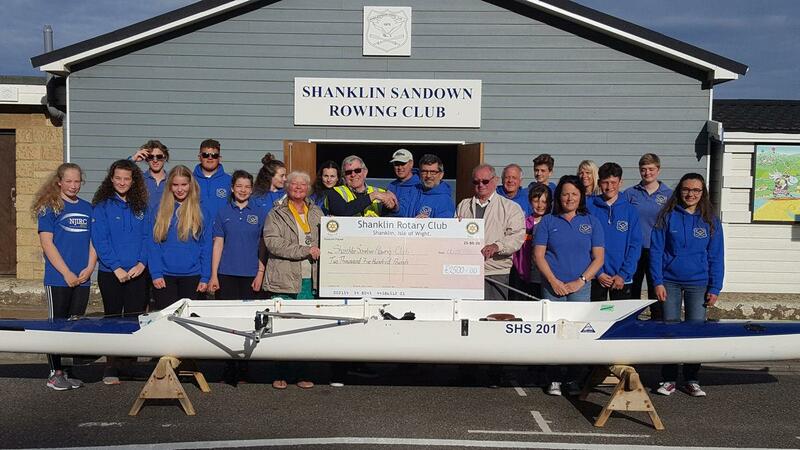 Members of Shanklin Rotary Club visited Shanklin & Sandown Rowing Club on the Esplanade recently, to present them with a cheque for £2,500, in recognition of their contribution to the success of this year’s annual sale, which grossed more than £32,000. The Rowing Club helped man (person?) the delivery and collection vans on the crucial weekends, where all the heavy lifting is involved, which was much appreciated. We are told the monies will be used to help in the running of their Regatta, kitchen refurbishment and the purchase of a new river boat. Pictured R to L; Lyn Fleming (SRC Vice President), Steve Knight (SRC President), Gary Burch (S&SRC President) and John Fleming (SRC Secretary), along with members of Shanklin & Sandown Rowing Club.